I’m sure you’ve faced your share of mean, insensitive, hurtful stuff in your life. Harsh, condemning words can pierce you like a knife and the wounds they leave can cause pain for long periods of time as they heal. Some of these wounds can cause permanent injuries that leave you limping for the rest of your life. If only we had some kind of protective covering! How about a bullet-proof vest to stop the incoming bullets and sharp objects aimed at you? Well, God has it. His protective clothing is made of compassion, kindness, humility, gentleness, and patience. What is amazing about God’s protective clothing is that it defends you against more than just the attacks you face from others. It guards against those attacks you might inflict upon others as well. Here’s how God’s protective vest works. Direct attacks of insensitivity and harm, are deflected by compassion and kindness, freeing you from the desire to respond in kind. If you are clothed in humility, the pride of others does not require a prideful rebuttal, but allows you to be gentle and patient in return. Remember, treating someone harshly hurts both the deliverer and the receiver. God, in his infinite wisdom, has created this garment with this glorious twofold purpose—to protect each of us from the harm of both outgoing and incoming nastiness. So dress up today! 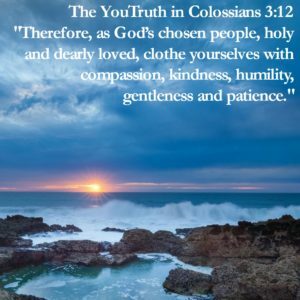 Put on the protective clothing of His compassion, kindness, humility, gentleness, and patience.